The ESC, in collaboration with the ACP Planning and Visioning, assisted the Baltimore Metropolitan Council in looking beyond issues of mobility to identify a broad regional consensus on issues such as land use and development patterns, transportation alternatives, the environment, and economic development. During the first phase of the project, ESC used extensive GIS analysis to identify and create maps of potentially developable areas within the five counties and City of Baltimore region and compared the available land area with the region’s projected growth needs. At planning workshops, stakeholders distributed projected development on these maps at various densities, revealing the relationships between development pressures and open space protection, density thresholds needed to support public transportation, and regional sustainability. This enabled citizens to make more informed choices and was critical in reaching consensus on three distinct development strategies. 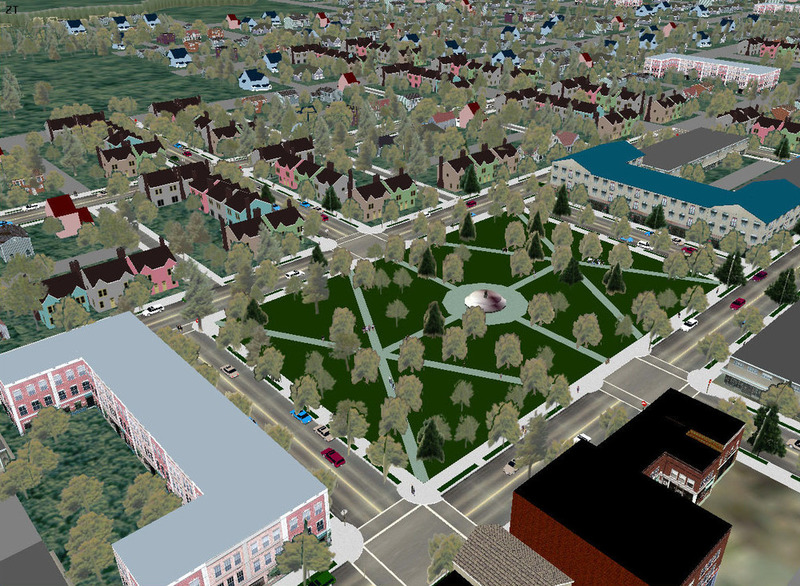 Prototypical examples of these strategies were then modeled in an accurate, interactive, real time 3D environment to enable citizens and stakeholders to visualize the impacts of each strategy in aesthetic as well as analytical terms. The simulations, visualizations, analysis and data were mutually accountable, and were presented at 17 workshops throughout the region over the spring and summer of 2002. Participants noted that the 3D modeling and analysis help create a common language for understanding the impacts of regional growth and alternative ways the region could grow.